It was an exciting pitchers’ duel in the third game of the World Series. Yesterday, my ACTION freshmen research group did a great job in presenting work on “swing and miss” data. To recognize their accomplishment, it seemed appropriate to analyze last night’s game from a “swing and miss” perspective. First, how often did batters swing at pitches, how often did they miss the pitch, and did the percentage differ between the two teams? 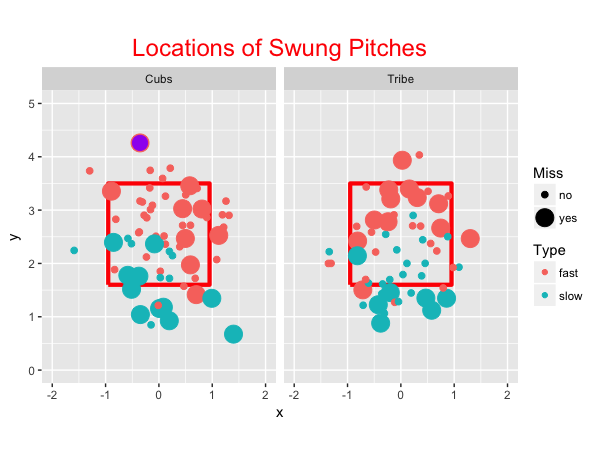 We see that the Cubs missed 22 out of 66 swings, the Indians 19 out of 60, and so they were very similar — both teams tended to miss about 1/3 of their swings. Next, we explore the effect of the pitch type. 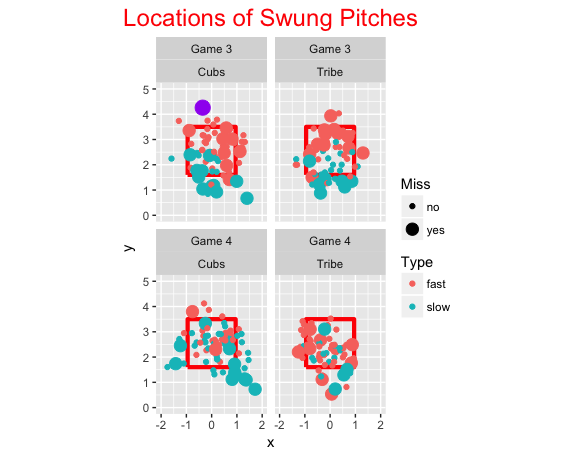 Since a large number of pitch types were thrown, we classify them into fast (“FC”, “FF”, “FT”, “SI”) or slow (“CH”, “CU”, “KC”, “SL”) and see how the swings and misses varied between slow and fast pitches for each team. This is an interesting pattern and deserves a graph. In this game, the Cubs appeared to be more susceptible to off-speed pitches — they missed 59% of them compared to only 26% for the Indians. 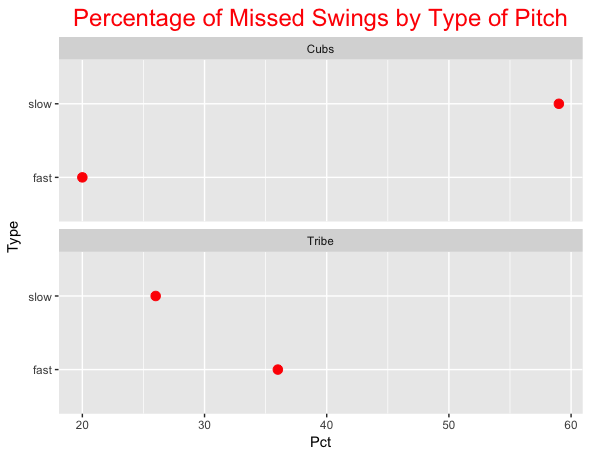 The Tribe missed a larger percentage of fastballs. Let’s look at the location of these pitches that were swung at. I use color to distinguish the type of pitch (fast or slow) and use the size of the point to indicate if the batter missed the pitch (yes is large). As one might anticipate, batters tend to miss the low off-speed pitches and the high fastballs. Special Point in the Graph? You may have noticed that I have colored one special point purple. This is the last pitch in the game where Javier Baez missed a high fastball (really out of the zone) thrown by Cody Allen. The complete R script that I used to produce this work can be found on my gist site. The pitchRx package was used to download the pitchFX data. After watching Game 4 last night, I wondered if the Cubs pattern of swinging and missing at slow pitches out of the zone was continuing. Combining the results from the two games, the Cubs have missed 25 out of 68 swings at off-speed pitches (37%) contrasted with missing 12 out of 72 swings at fast balls (17%). In contrast, the Indians have missed 11 out of swings on 44 off-speed pitches (25%) and 20 out of swings on 86 fastballs (23%). Yeah, the Cubs have been susceptible to off-speed pitches. Here’s a new graph showing the locations of swings and misses of the two teams in Games 3 and 4.